But the problem is I already have. Not officially. Not in a spoken, defined way. But in the small ways of my thoughts and day-to-day living I have already forgotten. Forgotten what God has done in Annie’s life. Forgotten His faithfulness to us. I’ve gotten comfortable with Annie being ours. But I was reminded today. I met a friend’s parents who had a sweet story to share with me. They had a tiny newborn babe in March of 1965. She was born just over 7 pounds, pink, crying, a full head of dark hair, and seemingly healthy. The proud parents took their daughter home to settle into the exciting newborn haze. 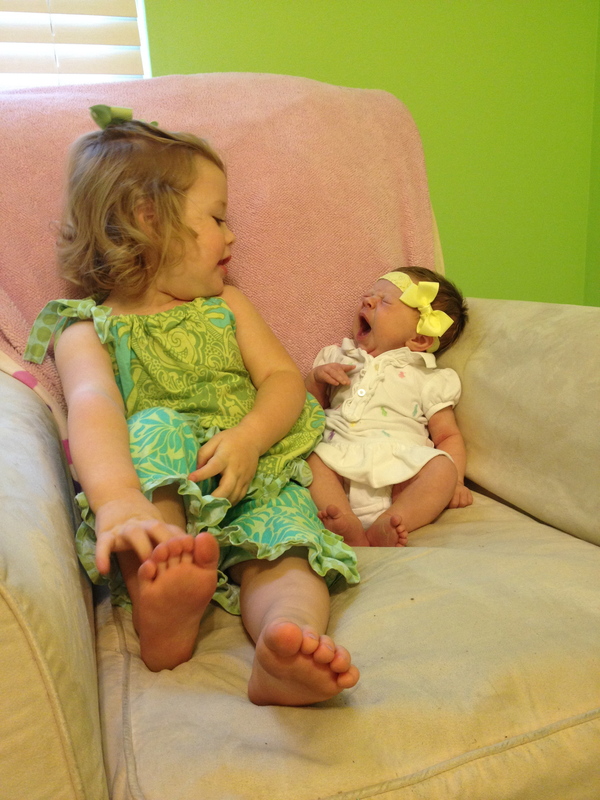 When their daughter was one week old, everything changed. Her healthy pink skin turned to grayish blue. She was having trouble breathing. They rushed her back to the hospital. She was admitted for testing and the doctors decided that something was wrong with her heart. The days unfolded and during an attempt at a lifesaving surgery, it was confirmed that, indeed, this baby girl’s heart only had two working chambers. Through tears that only a mother knows, she shared the horror that the doctors did all they could, but when the baby was 5 weeks and 2 days old she lost her fight against the congenital heart defect. My heart broke with hers, seeing the stinging pain still seeping through her eyes 49 years later. She went on to describe the sweetness of those five weeks they got with their baby girl, telling of sitting bedside in the ICU waiting and praying. They were only able to hold her a few times because of her critical condition. While I cannot fully identify with her loss, those raw ICU moments are so fresh in our story. And talking with her teaches me that they alway will be. The more we talked about Annie’s surgery and the surgery performed on their little girl, the more we agreed that she likely had what Annie has. It’s just that in 1965 the doctors weren’t sure how to diagnose it. I know it’s no coincidence for either of us to have met on this day that my HLHS baby is 5 weeks 2 days old. Two families who have baby girls born seemingly healthy, just over 7 pounds with heads full of dark hair; both with only two working heart chambers; both with secrets in the mother’s eyes and hearts that shouldn’t be. God always finds a way to connect people who can piece together His story. I’m thankful today for the courage I saw in this mother’s face and her transparency about her journey. Because today that is what I needed to remember that Annie shouldn’t be here. That the fear I live in over losing her is real, but also the comfort to see in someone’s real life that whatever the story of a baby’s heart ends up being is ultimately God’s story of His heart that He chooses for His purposes and His glory. Thank you to heart moms everywhere for your continued inspiration in my life! …in a much less heroic way though than when I was waiting to hear if my 5-day-old would live through having her chest cut open and her walnut-sized heart reconstructed. The survival I’m fighting for now looks a little different than those bedside grieving, hoping, praying days. 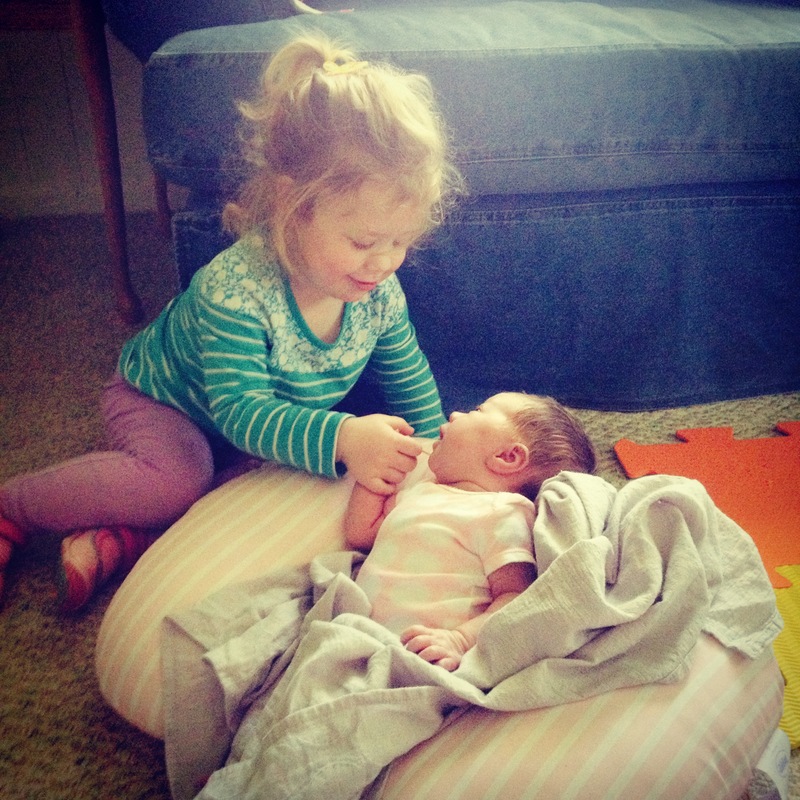 It looks more like sticky countertops, (almost) 2-year-old tantrums, midnight feedings, 2am feedings, 4am feedings…that all lead to diapers and more diapers, and standing guard between big sister and her overly strong loving hugs to baby sister. You get the idea. That’s the simple reality of having two little ones. Then there’s the reality that Annie is a special baby. Her time at home has been so wonderful. We’ve been thankful that she doesn’t have a single wire or monitor on her, we don’t administer a single medicine, and she hasn’t required a lot of extra care. We take her pulse ox each morning and weigh her each night, that’s it. But just because the wires aren’t there doesn’t mean the worries aren’t. Constantly, in the back (and front and side and ALL OVER) of my mind is the stress, the unbelievable pressure of the what ifs. The Philadelphia team was very clear: 20-30% of hypoplast babies die during the interstage period between the first and second surgeries. They clearly explicated the numerous red flags to watch for. Things like Annie being overly irritable, not eating well, not having enough wet diapers in a day, being extra sleepy and hard to rouse, having a fever, and more. So welcome to my worry world. When she fusses in the evening during a normal newborn cranky session, my mind races. “How irritable is overly irritable?” When I throw her diaper in the pail and forget to mark my tally, “Oh no! Was that wet #5 or #6? But wait was that one wet or just dirty?” (Retrieve from the pail to finger test and smell test…serious.) When 3 hours and 1 second have passed since she ate last, “This is it. This is the extra sleepy. She’s not eating well. They said 3 hours and I cannot believe it’s happening. She’s gone an extra second and now she must be a bad eater. Here comes the feeding tube.” And when the VERY FIRST full day she was home from the hospital Audrey had a fever, I texted Annie’s cardiologist and just knew it was all over. Oh yeah, and then there’s the daily weights. She’s supposed to gain an ounce a day. Over the weekend she lost two ounces from Friday to Sunday night. Oh my! I would like to publicly apologize to our friend who is Annie’s dietician for the multitude of worried momma texts with explicit details about how many exact ounces of high calorie formula Annie had and how many minutes she nursed and on and on. And Annie cannot cry for long. When we had the luxury of seeing all of her numbers every second of every day while in the hospital, we saw what happened to her heart rate and her oxygen sats when she got really worked up. We can see her face flush from light pink to grey blue when we’ve had to actually tend to Audrey for a minute, drive somewhere, or heaven forbid, set her down to go to the bathroom or lay her in her own bed at night. So needless to say, she won’t be a Ferber baby. Fine with me, I’m more of a Dr. Sears follower myself. (Speaking of Dr. Sears, I need to ask him how to get my 23-month-old out of my bed so my 4-week-old has a spot!) But it’s impossible to ensure that a newborn doesn’t cry! And impossible not to worry when ours does! They said that sometimes it’s not just the babies, but that heart moms need medicine too because it’s all so overwhelming. Sign me up for the highest dose! And one more thing. It’s baseball season, so Matt is at school late almost every night. I’ve been super thankful for my mom who has literally gotten me through the last two weeks. Some days she comes all day. Some days, I pretend to be brave enough and capable of mothering two kids on my own, only to be rudely reminded by the tug of war I’m in (losing) with my toddler over my newborn’s car seat in our pediatrician’s waiting room. I consoled myself that at least my girls were both bathed and bowed for the kind stares from the lobby audience. C’mon, like it’s never happened to YOU before, I wanted to shout. But instead, I smiled at them, somehow won the tugging, and scooped my tantrumming toddler off the doctor’s office floor. So I am thrilled that this is our life. That we have two precious, lovely daughters. I often look at both of their sweet faces and cry tears of so much joy because I cannot believe that I’m living a real-live dream come true. But it’s also reality. I sometimes look at both of their tear-streaked faces and cry with them because the days, the moments, the seconds are the hardest I’ve ever known. But also the best I’ve ever known.